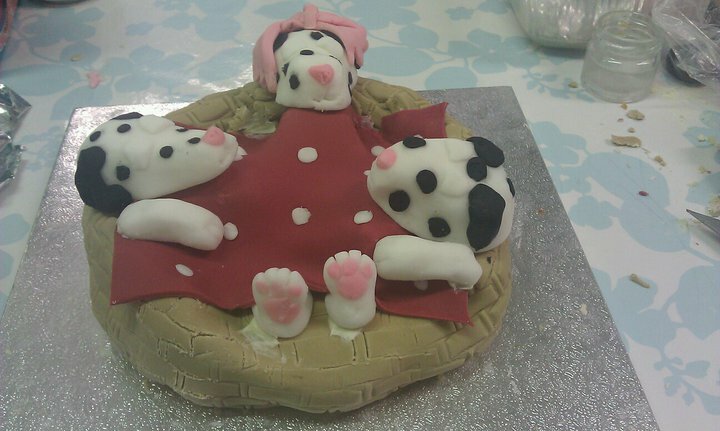 About a year and a half ago, before I started this blog, I took a four-week cake decorating course at Kingston Adult Education college in Surbiton (on the outskirts of London). For a while now I'd been thinking about doing a more in-depth course to learn a little more than how to pipe buttercream onto cupcakes, but all the classes I'd found in central London cost at least £99 for a one-day course, and I've seen some that cost almost twice that. Then I started browsing adult education websites and realised this was potentially a much better option - and certainly cheaper. Unfortunately adult education colleges don't tend to be in central London so the best course I could find was in Surbiton - and it took me almost two hours to get there after work (I only just got there in time for the 7pm start) and about an hour and a half to get home. Since then I've taken a course at a college just a few minutes from my house but at the time this was all I could find. The course was two hours a week for four weeks, covering different techniques every time, and only cost £40 for all four weeks. My friend David and I decided to sign up and do it together, and I was really glad we did! The course was taught by a very experienced cake decorator called Annie. I swiftly discovered that David and I were the only ones coming from central London after work - everyone else seemed to be local to Surbiton and had managed to go home first and have dinner (dinner for us was a sandwich eaten with one hand in class while modelling icing!) and could load their cars with all the equipment we needed to bring, whereas we had to carry it all on the tube! Luckily the class was worth the effort that we went to. We didn't have to bring a cake for our first week, but were asked to bring white roll-out icing, a box of Dr Oetker coloured icing, a rolling pin and various other bits and bobs that I forget now. 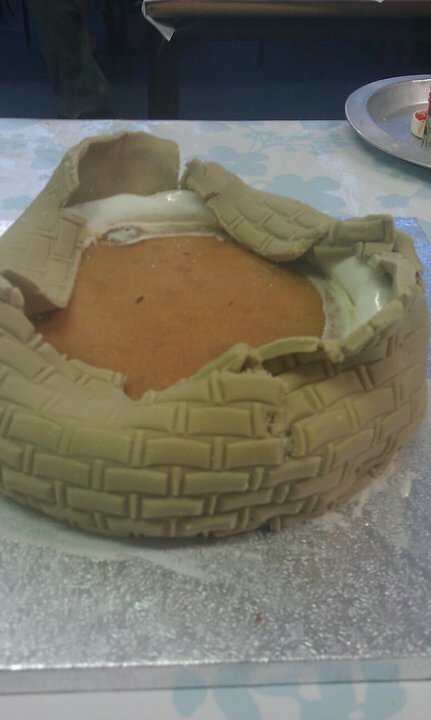 We were told we were going to spend the next two weeks making a dog basket cake, and Annie began by showing us a picture of one she had made previously. I couldn't believe I was going to be able to make something like that! Now of course it looks really straightforward but at the time I had never made anything like that before. We spent the whole of the first class making dalmation dogs to go on top of the cake, as you can see below! So how did we do this? First, take a ball of white icing and mould to make the shape of the head - so wider at one end a little like a carrot, and then flatten the bottom slightly so it sits flat. This was the first time I'd modelled with icing so I wasn't happy with my first few shapes, but the beauty of roll-out icing is that you can re-do it over and over! Next we took some of the Dr. Oetker black icing (you get five colours in the pack, including black). Roll some very small balls and squash them so they become discs, and press them onto the dog's head. Similarly, use the black icing to make some ears. We coloured some white icing with a little pink paste to make the nose, and used a modelling tool to indent the eyes and mouth. The feet were fairly easy too - for the front paws, just mould some white icing. 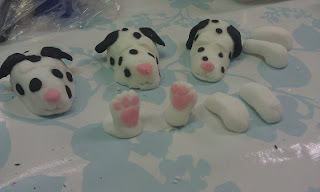 For the back paws, mould icing in the shape you can see above, and roll then press out some tiny balls of pink icing to make the soft pads on the paws. As this took the whole lesson, we would then leave the dogs until next week, so we wrapped them in clingfilm and tried to transport them home as carefully as we could. So it's probably no surprise that the next week began with a quick repair job to the dogs where a couple of people had found an ear or a nose had fallen off! This week we had been told to bring a cake and a cake board, along with all the stuff from last week - white and coloured roll-out icing , rolling pin etc. To start with, I rolled a cylinder of icing and stuck it along one edge of my cake to make one side more raised than the other. Most people actually achieved this effect by cutting a section out of one side of their cake but as my cake wasn't as deep as some peoples', we decided this was the best way. Basically what you want is for one side to be a little higher as you can see from the picture a little further below. Then we coloured some roll-out icing with brown paste and rolled out a section large enough to fit all the way around the cake and a couple of inches higher than the side. We stamped all over this with a basketweave embosser, which I thought was really cool. It's a piece of plastic with basket or brick-like markings and a little handle, so when you press it into icing you are left with the indentations. The next part was relatively easy. We chose another colour and rolled out a square of icing to make a blanket. I rolled out some tiny balls and pressed them on to make a polkadot effect. Then position your dogs' heads and paws in the basket and put the blanket over the top, so it looks as if they are asleep under the blanket in their basket. The proportions are a little off - if you think about the size of the dogs' heads, there is no way there's room for three bodies under that blanket! Other than that I was really pleased with this - my first character cake. Incidentally the cake underneath was a plain sponge - we were told not to split and fill it, which I think did make it taste a little bland, and I reckon I could have got away with doing this and still been able to model the basket around it, so if I did it again I would either do that or make a chocolate cake as I think that would have tasted nicer. My sister's birthday was a few days after this cake class and I was going down to Southampton to see her, so I took this cake. I had told her she was getting a birthday cake but she said she hadn't expected anything like this - and it was perfect for her as she has dogs. She didn't even want to cut into it initially to spoil the effect, which was a really nice thing to hear! The letter for this month's Alphabakes is D and since I hadn't gotten around to blogging this dog cake yet, it seemed like the perfect opportunity! Please do send in your D bakes as we have a prize on offer this month! What a beautiful cake!! 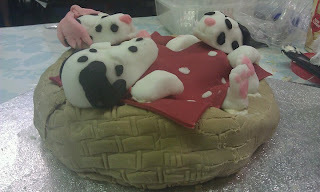 I also took adult classes in cake decorating in the States - SO much fun! Oh! 'D' is for David, and it's good enough for me? That was a fun set of classes, although getting there and importantly, back home, was, as you mention, an absolute nightmare. Those classes were good, it was the first time I learnt to cover a cake in fondant!